The Tron panto has always had a cheeky disregard for every other Christmas show in town, but 2012 will be remembered as the year it declared outright war on Scottish theatre. Johnny McKnight’s uproarious demolition job on Dickens manages also to take sideswipes at the Krankies at the SECC, to include a song with a chorus that rhymes ‘whole lot worse’ with Edinburgh’s Traverse and, at a point when it takes a turn for the depressing, to suggest Aganeza Scrooge is turning into a National Theatre of Scotland show. Little chance of that, although actually, it makes an inspired companion piece to the NTS’s sell-out version of A Christmas Carol, currently wowing them in Fife. McKnight replaces that show’s gothic creepiness with a heightened air of panto panic, throwing in daft routines, excellent songs and lots of audience backchat without ever losing sight of the original. So brazenly does he mould the seasonal tale into a knockabout romp, he almost makes you forget it has never been a panto staple and that jokes about abject Victorian poverty (‘They’re a poor house – they’re supposed to be poor’) would be considered bad taste in any other theatre. And you’re very willing to forget Dickens didn’t write for an all-women cast, so compelling is the cross-dressed McKnight and the superb female company (plus ace understudy Darren Brownlie) as they race from Dickensian Street to Aganeza’s Merchant City boudoir in search of panto past, present and yet to be. There’s so much to love about the show – from Kenny Miller’s gorgeous monochrome designs to Sally Reid as Tiny Tim and her running joke about polio – that you may not notice how faithful McKnight is to A Christmas Carol. What you certainly do notice, though, is how moving is Aganeza’s redemption and how joyous the final chorus of ‘All I Want for Christmas’. 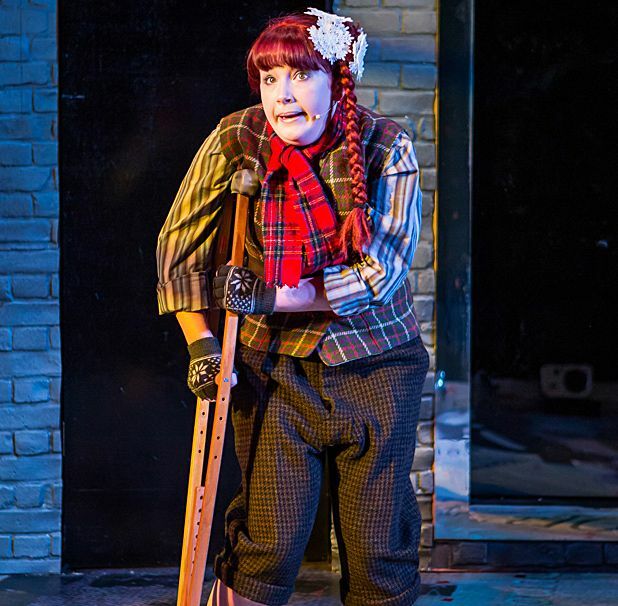 Tron Theatre, Glasgow, until Sat 5 Jan.
Once again written and directed by expert panto-master Johnny McKnight, the Tron's original festive effort features a familiar skinflint, re-born as a lady, but even nastier.